← Access to Food Supply: Whose responsibility? One of the sad things about Christianity is the ease with which some of those following the faith turn to become intolerant of anyone who might be walking a slightly different path. Even within the first generation of those forming the Christian Church the number of such divisive beliefs was extraordinary. Although Paul was only addressing one particular Church community and highlighting their divisions – which would be very different from our divisions today – in his day people appear to have been as likely to reject people for legalistic reasons as they are today. We might note that although the points of difference Paul referred to now might seem to us to be trivial and peculiar to the church culture of the time, yet in their setting, the issues must have seemed great indeed. Paul talks for example about the division meat eating caused. Remember that in those days the issue was not so much the attraction of vegetarianism but rather a reaction to the fact that it was difficult to ensure that meat had been killed according to religious tradition. Meat which even had a slight chance of being killed according to some other tradition was considered to be contaminated and unlawful to eat by those with a Jewish background. If the meat for example, had been sacrificed on a pagan altar, or not killed according to strict religious protocol, it was thought to go against sacred rule to eat it. For those living in Rome, the chances that purchased meat was killed according to Jewish law would have been much less than they would have been in Jerusalem. There were also disputes about days. Remember again we are talking Rome. There some of the new gentile converts to Christianity would have been far less attached to the Jewish sacred feasts and specific Holy days which were generally still followed by the early Christians who were Jewish. Conversely the non Jewish Gentile Christians would no doubt be wishing to retain some of their own more traditional days and festivals. Remember that both Christmas and Easter were originally non-Jewish and non-Christian feasts that got borrowed by the Christian Church and changed in meaning. Paul was not so much saying the rules should be ignored. He was more suggesting that where the rules are dividing – we should look behind those rules to the principles and insights that unite us. I guess one possible reason why Paul was far less attached to specific rules even if they came from scripture was that since becoming a Christian, Paul the missionary had been an inveterate traveller. Travel in strange places is great for realising that outward customs come in many different forms yet many might simply be different outward manifestations of what are essentially the same ideals and values. Paul rightly sees the danger in disputes within the faith. Insisting on different customs and rules can lead to hurtful criticisms and abuse. Paul identified such divisiveness as being very destructive to the emerging Church community. Seeing beyond the different observances of religious custom whether it be communion, baptism, rites of membership, or the insistence of certain wording of our creeds, Paul’s suggestion that instead we should focus on what Jesus stood for, gives us a sense of perspective taking us back to centrality of principles of compassion, forgiveness and tolerance. For some it will be issues like whether or not homosexual ministers are acceptable to the Church, for others it might be how we find meaning in the Bible, whether or not there is a heaven, whether or not God can change the weather or someone’s illness if we pray…Whether or not Christians should drink alcohol… and so on. Because we are all inclined to believe that our chosen faith is the best, we might also be uncomfortable with those who teach other versions of Christianity – thus for Protestants the teachings of the Jehovah’s witnesses, the Mormons and the Roman Catholics are all slightly suspect – yet as soon as we hear Jesus calling us back to his essential principles these things seem somehow of little consequence. Yes and for those of a very conservative faith, there may well be 613 rules comprising the law of the Old Testament. We might for example use those rules selectively to deal to those we don’t like – and say we are enlisting God on our side. Yet Paul says we have to put the rule dividing differences to one side as we focus on what Jesus really was about. And what again was it that Jesus said? The most important rule is, “Listen, Israel, the Lord your God is one Lord. You’ve got to love the Lord your God with your whole being – with your whole heart and every ounce of energy.” And the second most important rule is, “You must love your fellow human beings as much as you love yourself.” No other rule is greater than these two. With these words, Jesus abolishes religion of the sort which tries to cajole God into supporting whatever our current rules might be. He pioneers the way for Paul and, much later, the way for some of our modern prophets like Colin Morris as they point out that a religion of rules can neither buy God’s approval nor bring social justice. If our version of Christianity causes us to separate ourselves from our wider community and not notice where things are going astray for our community and our world our religion becomes less relevant. The upshot of Paul’s writing for us today is, I think, to recognise that the way our current rules and customs shape our religion in churches on Sunday may help us develop what to us are comfortable customs but in no way should they define how we are to be Christian. Nor is the Christian way of life even defined by an ability to believe six impossible things before breakfast of the sort we might find in the detail of our creeds. . But Christians are still defined by a choice to love – rather than by obedience to religious laws (says Jesus); by a willingness to set aside the security of external ceremonies (says Paul); and both imply the need to focus on issues where the principles of Jesus need a clear input. Let us stop to consider one of the big issues of the day. All is not well in this world. The economists and scientists tell us that for the possible the first time in history there is enough food on the planet to feed all the population. Yet the international surveys tell us that there are many obese – as well as many who remain hungry. Those who are hungry are in effect being denied access to the food. Almost a billion are seriously hungry – many to the point of starvation and in many countries (including New Zealand) there has been a growing gap between the rich and the poor. There may be a good number who attend Church – but among the ones who are attending to the principles of Jesus are those who show by thought, word and action that they wish to narrow the gap between the rich and the poor. Attending to minimal rules of honesty would probably lead you to overlook the gap between the rich and the poor so here too in fact Paul is right to remind us that we need the over-riding principles. In Words We Live By Brian Burrell tells of an armed robber named Dennis Lee Curtis who was arrested in 1992, in Rapid City, South Dakota. Curtis had a clear idea about what for him was a code of acceptable and unacceptable practice. In his wallet the police found a sheet of paper with the following code. 1. I will not kill anyone unless I have to. 3. I will rob only at night. 4. I will not wear a mask. 5. I will not rob mini-marts or 7 – Eleven stores. 6. If I get chased by cops on foot, I will get away. If chased by vehicle, I will not put the lives of innocent civilians on the line. 7. I will rob only seven months out of the year. 8. I will enjoy robbing from the rich to give to the poor. It will not surprise you that the Judge took no notice of this code and passed the standard judgement according to the wider principle of accepted law. It seems to me that the overriding principles that Jesus taught would provide a good guide as to what is acceptable whether it be moral decisions about helping the poor and the hungry – decisions about what is acceptable behaviour for Denis Lee Curtis – or even the question as to what is the most desirable way to interact with those whose journey in faith is different to our own. It is inevitable that sooner or later we will encounter those who see life and faith differently to ourselves. We will always be tempted to focus on the differences. Yet in the midst of the rivalries there is a quiet insistent voice calling us to new possibilities as we meet in a spirit of love. This entry was posted in Sermons and tagged differences, different Holy days, eating meat, homily, Jesus, Lectionary sermon, Paul. Bookmark the permalink. Of course Paul’s teaching would address divisions in the Church community. He was a Roman teaching a derivative of the Jewish religion. He was apparently so inspired by some kind of experience that he wanted to preach. 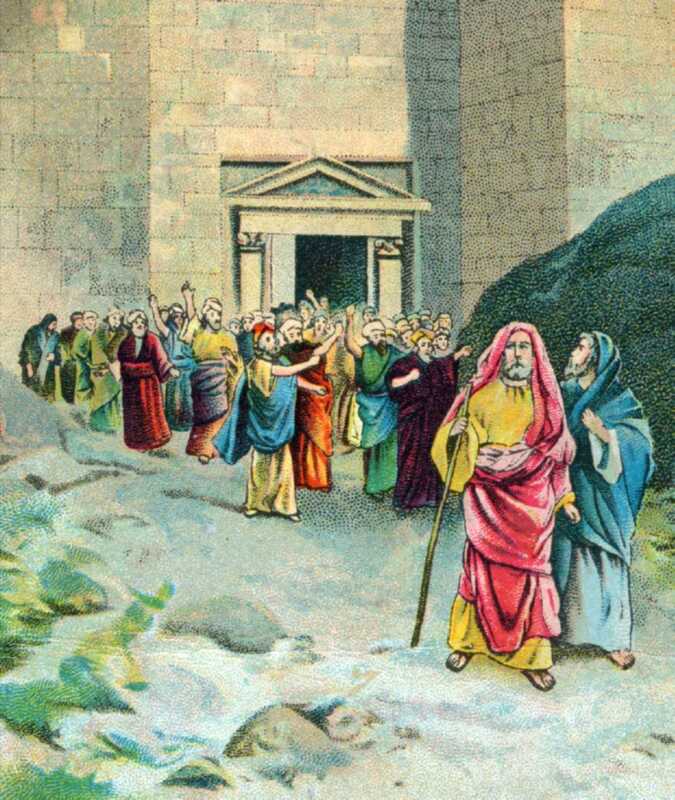 Since the Jewish leadership under James was not interested in his perspective, Paul had to preach elsewhere. Paul had his own spin on the Jewish religion, including a tolerance for the non-conformance of the rigid rules of that religion – since he himself had not been raised with that emphasis. Paul’s derivative probably found adherents more readily among the Gentiles because of this laxity. Paul’s teaching spawned a new religion that is somewhat based on Judaism, so Paul’s own formulations being based on what became the Old Testament (in addition to his references to Jesus the Christ or Messiah) provided some ‘history’ for those that came to follow this new religion. Each religious preacher tends to have their own personal spin, based on their own perspective, of the earlier religious myths and doctrines. Dwelling on differences makes it easier to understand why one doctrine might be preferred over another; dwelling on commonality makes it easier to accept those of another religion and perhaps switch allegiance. Every religion if it will gain any adherents must have this directive somewhere in its important doctrines. The simple statement implies empathy, the recognition and acceptance of others. The original four cardinal virtues appear to be recorded first in the writing of Plato, a Greek philosopher who lived roughly 400 years before Jesus. Empathy is not rooted in religion, though it must be central to it for any religion to succeed. Some level of empathy can be observed in other social animals like chimpanzees or bonobos; empathy is a characteristic of a social creature and human beings are obviously an advanced social being. Empathy is the requirement for the well-being of any community. The ability to recognize the needs, wants, abilities, disabilities, and concerns of others is necessary to be an active participant and contributor to the community. The ‘commandments’ of any religion are typically aimed against behaviors that imply a lack of empathy, like harming others or stealing what is important to them. Religions that inspire intolerance for others (like of another faith, race, etc.) are obviously leading to violations of that second commandment. The spirit of love you wish to invoke is not based in a religion but is based simply on the necessity for empathy, part of our inherent social nature. Thanks Dave, some interesting thoughts. The cultural component of any faith is always hard to disentangle from beliefs that can stand by themselves as universal principles. Typically those who focus on principles that can unite seem to get a rough time from those who focus on historically embedded positions which reinforce heirarchy and status. The Bahhai who set out to look for unifying principles have been persecuted – as have the Sikhs. Those who call the faithful back to founding principles similarly seem to arouse antagonism. Luther and Wesley were hardly popular with the establishment parent churches.